As Syria is starting to go through a transitional period, one of Iran’s main interests is to save President Bashar al-Assad in power for a meaningful period. However, against the mainstream thought, Iran’s calculations in this regard have primarily a pragmatic nature, rather than an ideological one. Given the highly fragmented and competitive nature of the Syrian opposition, Iran believes that forcing Assad out of power at the current moment would lead to further destabilization of the situation. Thus, Iran supports the idea of keeping Assad in power until the end of transitional period, when the situation becomes stable enough to hold an election and decide the future based on the will of the Syrian people. Iran’s second interest is to preserve the territorial integrity of Syria. Iranian leaders believe that suggestions regarding the creation of a federal system of government in Syria or giving autonomy to some regions are devised with the aim of weakening and partitioning Syria, thereby containing Iran’s influence over one of the most critical geopolitical anchors in the region. In Islamic Republic’s view, this is especially what the United States and its regional allies are trying to do in order to contain Iran’s regional influence. For this reason, Iran has been worried from the very begging over the US plan to empower the Syrian Kurdish groups and believes that Washington aims at using Kurds as leverage in the future of Syria. Iran’s other principal and persistent concern regarding the Syrian issue is that Israel might build upon the continuing chaos to increase the level of its involvement in the crisis, tying the Syrian government’s hand for the future moves by targeting its military potentials. In Tehran’s view, Israel has actually started to do so and the final goal is to deprive Iran from a reliable ally in the Levant, right close to the Israeli borders. To secure this set of goals, Iran feels necessary to continue its current involvement in both military and political fronts. On the military front, Iran will continue its close cooperation with the Syrian government, as well as Russia, to secure the rule of Damascus over as much territories of the country as possible. On the political level, Iran sees Astana peace track as the most effective way for bingeing stability to Syria; therefore insists on the centrality of this track among various peace initiatives for Syria. As for the issue of re-constructing Syria in the post-war period, Iran is worried that the presence of western countries would lead to a gradual influence for them in Syria in the future. 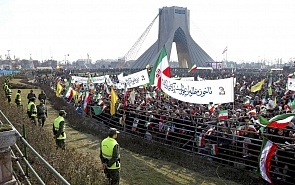 At the same time, Iran lacks the necessary resources to take the leading role in re-construction work. Thus, the only meaningful way for Iran is to coordinate its effort in this regard with non-western powers, most importantly China and Russia. This indeed does not mean that Iran feels itself completely secured against these powers in the long term, but it would be the most reliable, most reasonable option. In the post-war Iraq, Iran’s main goal is to help preserve the territorial integrity of the country, as well as the authority and political legitimacy of the central government in Baghdad. In this vein, Iran has been and continues to be, against the independence of Iraq’s Kurdistan region. To preserve this interest, Iran has utilized a two-sided approach: strongly supporting Baghdad in face of the Kurdish centrifugal moves, while at the same time, keeping close contacts with the Kurds and an acceptable level of bilateral relations with KRG in order to keep them contained and cautious toward Iran’s interests in Iraq and the whole region. As another issue of interest, Iran wants the current system of power distribution between different Iraqi factions to be preserved, so that pro-Iran Shia groups would continue to keep their influence in the country. In this vein, Iran tries to help various Shia factions in Iraq to stay unified, acting as a political mediator between them. Iran believes that the regional rivals are trying to make gaps among Iraqi Shia groups to gradually force them out of the political scene, thereby contain Iran’s influence in the country. In Lebanon’s current developments, Iran sees a joint plan by the western powers, together with Saudi Arabia and Israel to decrease the Iranian influence by targeting its main Lebanese ally, namely Hezbollah. To Iran, Saudi Arabia’s pressures on Prime Minister Sa’ad Hariri, America’s “conditional” supports for the Lebanese Army and the renewed Israeli threats to wage a new war with Lebanon, all are pieces of a puzzle made to gradually de-legitimize Hezbollah and force it out of the scene. To prevent this plan from being realized, while preserving its close ties with Hezbollah, Iran has been trying to reach a rapprochement with more divergent Lebanese factions, especially Hariri’s camp. Results of these efforts however are yet to be seen, given the complex nature of situation surrounding Lebanon. Iran has been watching closely and with concern the recent signs of rapprochement between some Arab capitals and Tel-Aviv. Iran believes that by turning the perceived “Iran Threat” into the main security problem for the Arabs, Tel-Aviv and Washington are trying to form a regional axis against Iran. This has even caused influential Arab states to take a modest stance regarding US President Donald Trump’s decision to declare Jerusalem as the capital of Israel. However, Iran aims at turning the threat to a new opportunity and introduce itself as the only real supporter of the Palestinian cause among Muslim countries. Doing so, Iran would be able to contain the US-Israeli threat from within. Iran’s approach toward the interactions among Persian Gulf states is based on counter-balancing. Iran tries to build upon the recent gap between the members of GCC and by strengthening its ties with Qatar, nullify Saudi plans to form a kind of Arab-Sunni coalition against Iran. On the other hand, Iran sees the Yemen crisis as an opportunity to keep the pressure alive on Saudi Arabia by supporting the Houthis. However, Iran has been cautious to restrict its backing of the Houthis to the political support, not to provide Riyadh and its allies with an excuse to enter a direct confrontation with Iran. Despite its campaign to blame Iran for arming the Houthis, Saudi Arabia has not yet been able to provide any acceptable evidence to convince the international community that Iran has done or is doing so. Which ‘red lines’ should neither Iran nor its opponents cross? After recognizing Iran’s main interests in the Middle East, now it’s easier to reach an understanding of Iran’s red lines in the region. First of all, Iran is opposed to any “external” - or in conjunction with the external powers – plan to alter the current borders in the region, interpreting it as a challenge to the regional stability, as well as its own power and influence. In Iran’s view, the United States is seeking to divide the region into a set of smaller states in order to facilitate its power projection and keep the regional balance of power in its own favorable direction. Second, considering itself as being surrounded by a diverse range of threats in its neighborhood, Iran finds it necessary to focus on the development its deterrence power. Iran’s objection to any negotiations on its missile capabilities can be understood in the same vein. Having been faced with an alignment of a number of regional and tarns-regional actors to contain it, Tehran sees the independent development of its military power as a mean for “survival” in a volatile and threatening geography. On the other hand, Iran believes that during the past three decades, it has been able to regain its position as an influential regional power in the Middle East by developing its elements of domestic power and at the same time, expanding its influence throughout the region. Accordingly, Iran insists that its current regional standing should be recognized by the other actors in the region. What confidence-building measures can be proposed to relieve the tension in Iran’s relations with other Middle Eastern states? If being observed by all sides, the latter point mentioned above, namely recognizing each other’s regional position and interests could be used as a means to overcome – at least partly – the “security dilemma” in the region. Iran’s engagement with Turkey on the Syrian issue, despite the sharp differences of opinions between the two sides, is a successful example of applying this approach, which is based on the mutual respect of Iran and Turkey to each other’s interests. It seems that in case of the existence of political will, the pattern is applicable to Iran’s relations with the Arab countries as well.